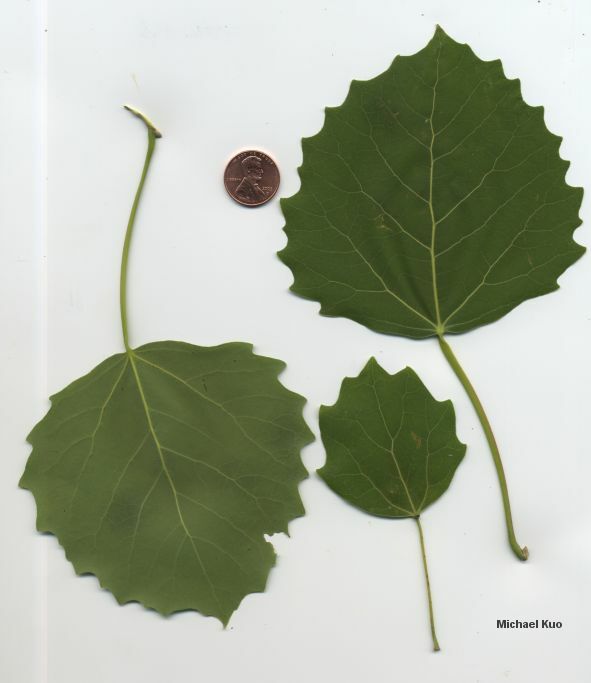 Similar to Quaking Aspen but restricted to northeastern North America; leaves semi-oval and pointed, with large, blunt teeth; bark whitish to yellowish, becoming furrowed near base of tree. 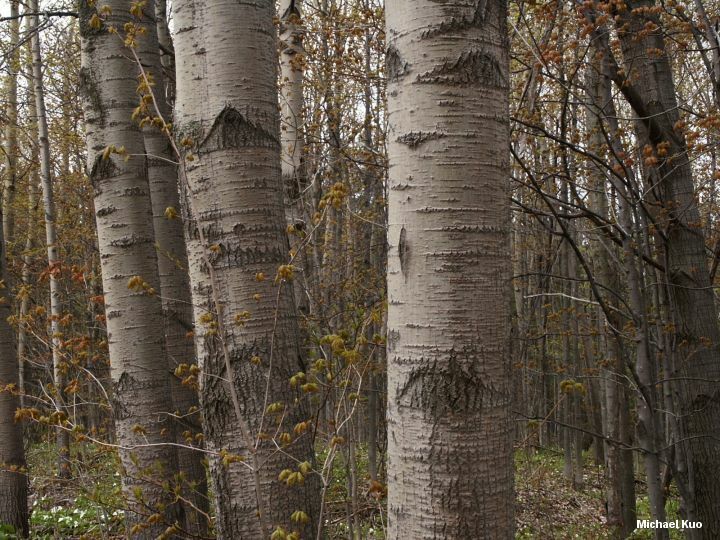 Habitat: Typically in pure stands or mixed with Quaking Aspen, in clustered groves; often colonizing burned or clear-cut areas and growing quickly and thickly; growing in northeastern North America. 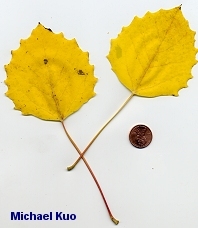 Stature: 30-70 feet high; to 2 feet in diameter; with a rounded crown; branches slender. Leaves: Semi-oval, with a blunt point; 2-4 inches across; green, turning yellow in fall; with fairly large, rounded-off teeth; thin; firm; stems to 2 inches long. Bark: Thin; more or less smooth; whitish or yellowish; typically becoming furrowed for about 3 feet at the base of the trunk (see illustration). Amanita muscaria var. formosa; Cantharellus cibarius var. pallidifolius; Cantharellus cinnabarinus; Cortinarius species; Gyromitra esculenta; Gyromitra korfii; Lactarius controversus; Lactarius uvidus; Leccinum species; Peniophora rufa; Phellinus tremulae; Suillus subaureus; and others.